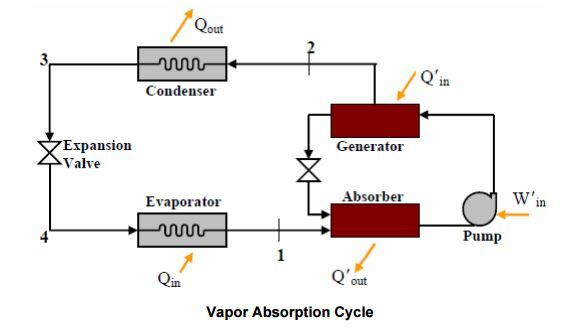 What is a Vapor Absorption Cooling System? 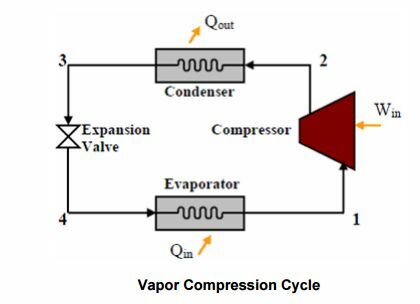 A refrigeration cycle uses mechanical compressor to help circulate the refrigerant. But in a Vapor Absorption Cooling System the pressure difference needed to achieve flow of the refrigerant is created using a heat source. Here we can say the cooling is achieved with heat. What makes an vapor absorption cooling system attractive is that it needs zero to little work input since a heat source can be found without the expense of mechanical energy. For example a solar panel can be used as a heat source and operate a vapor absorption cooler without spending any mechanical energy. Vapor absorption systems can utilize heat sources that would be otherwise discarded. For example a large factory with lots of thermal operations usually discards large amounts of heat generated. This heat can be utilized to work a vapor absorption cooling system.